The Bidding Adieu! series is one that focuses on games I own and trade in because I am finished with it or because a newer version of that game is coming out. Unlike game reviews that are done quickly as a game premieres, this gives an overall look at the game from my perspective during the life time that I have owned the game. 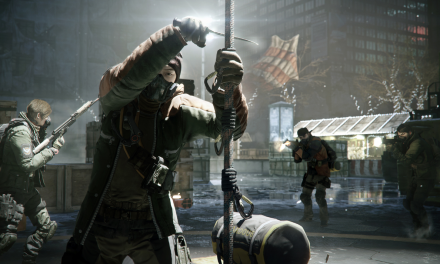 You will read about my experiences in the game, what I liked and did not like, and the reason that this game is no longer something that holds my interest enough to play or hold onto. So read as I bid a farewell full of memories and experiences centered around this Bidding Adieu!‘s Marvel vs Capcom 3: Fate of Two Worlds. 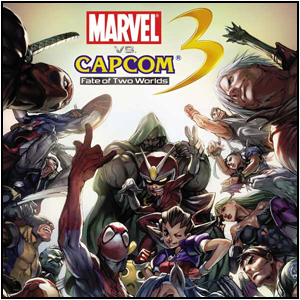 The reason behind me getting rid of Marvel vs Capcom 3: Fate of Two Worlds is because that the newer version of this game by CAPCOM, Ultimate Marvel vs Capcom 3 is on the verge of coming out on November 15th, 2011. I’ve had many upsets, disappointments, triumphs, and ultimately one of the best fighting game experiences in a long while with this game. Be sure to note that this is a fond farewell and is not one of “good riddance”. I enjoyed this game during its life span, but it is time to move onto something that is (hopefully) bigger and better. Right now, all hope is being placed on Ultimate Marvel to deliver the goods, so I guess I am not abandoning the game, I’m just giving it up for the newer version of it. Well, now that you know my reasons for abandonment, I want to breakdown the game as I saw it before it goes to Gamestop to be traded in towards my purchase of Ultimate Marvel vs Capcom 3. The Lord of the Dark Dimension, Dormammu. My most used and favorite character in Marvel vs Capcom 3. 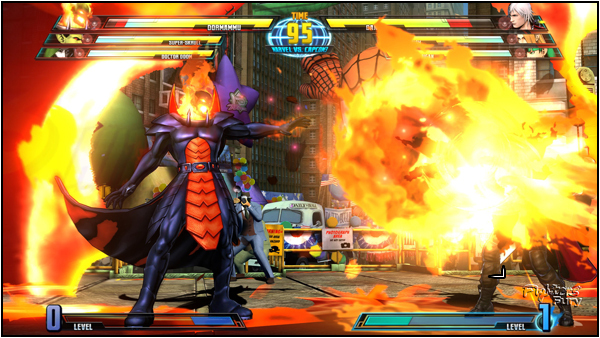 Marvel vs Capcom 3: Fate of Two Worlds offered a lot of good things for players to indulge themselves into. I’m going to name the things I really enjoyed about the game and why I liked them; hopefully some of you can identify with what I am saying. This game offered a great amount of replay value for me and my friends; especially that of Rasean (Riot Trigger), Saraí (DynaDASH), Ryan (Raikugen), and Brandon (Cain Mayne). Many sounds came of anguish and triumph in relation to our own experiences. Not only that, we each played different characters and our individuality showed through all of them, the combinations of teams you could make and play uniquely were quite stunning. Some teams I personally liked was: X-23/Dante/Dormammu (I also have a combo video titled Dues EX Ruina), Hsien-Ko/Ryu/Thor, Chun-Li/Hulk/Dead Pool, and Hulk/Sentinel/Hagger. Each one was different and focused on a different way to play; the game never got old or boring because I was constantly trying out new things. Teams were formed even if I did not use them very often; such as adding on Magneto with Dante/Dormammu, the team of Felicia/Super Skrull/Magneto,even trying out friends teams such as Ryu/X-23/Sentinel (Kuro Yami’s team) or Captain America/Task Master/Dr. doom (Skullomania, Rasean’s Team). Basically, you had rush down teams, under-powered underdog teams, broken teams, and some teams that should not work well at all together but managed to become a formidable force with the right person controlling it (Ryan’s team of Zero/Super Skrull/Dr. Doom, for instance). Within that, it added a variety of ways to play and learning how to overcome each and every obstacle was painstakingly fun in its own right. I will enjoy thoroughly learning how to fight opponents and defeat them in this new game with new “technology” at the disposal of all players; as well as spectator mode in lobbies to better utilize this. I also really enjoyed the fact that it felt like I excelled at this game more than most people; at least in my own personal opinion (Only other game I may have been an absolute monster in was BlazBlue: Calamity Trigger/BlazBlue: Continuum Shift). For my ending stats I played nearly 4,000 games, and even with me picking a lot of joke teams towards the end and taking it less seriously, I won 70% of my overall matches and 70% of my Ranked matches, which is insanity (Final stats will be posted at the end). It felt like only a few people ever really completely destroyed me, as most of the matches were honestly close. I believe the pinnacle of showing me my skill is, even without using my own arcade stick(I have a Xbox 360 and the tournament was on Playstation 3, and they had very cheap arcade stick while I have a SFIV: Round 2 Tournament Edition MadKatz stick) and going to a Marvel vs Capcom 3 tournament at A-Kon here in Dallas, Texas, I placed 4th and could have possibly won had I been able to get out the command for Dante’s “Million Dollars” super at the end (Lost my whole team to Lvl. 3 X-Factor Dante), but it is still an accomplishment nonetheless as peers (Even the tournament organizer for DFW Games) were surprised that I did not make it into the finals (Single Elimination Tournament). No matter how bad someone spammed, gimmicky they played, or how someone lagged I was able to actually come back and beat them or at least get close. It feels like, unlike Super Street Fighter IV, someone could not do a single tactic or mindlessly “poke” you and expect to win. Still, you fell pray to noob tactics sometimes, but generally someone who is less skilled will not win the match no matter what type of stuff they tried to pull. Something I also really enjoyed about this game was the music choices. The “Take You For a Ride” remix was something I enjoyed hearing at the menu screen, but really wish they did have the selection for the old music. The theme of Dante from Devil May Cry 3, as well as X-23’s theme really did the job for me and I found myself listening to these things over and over and over again; they will forever be additions to my music library. Something else is that it seems to actually hype up the mood and increase it to me. Excellent use of music changing when certain characters come in really does help you feel like you have something of a “home-field advantage” at times. I actually made my first combo video with this game; though, it has two versions the final one is called “Deus Ex Ruina” and is very impressive and actually got me featured on EventHubs for the first time. 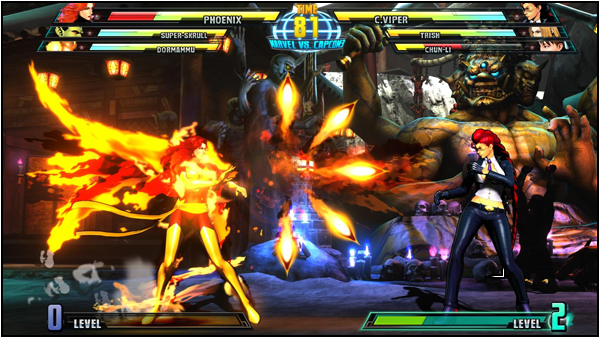 Dark Phoenix, the bane of Marvel vs Capcom 3. The ultimate gimmick character. No games are without their flaws, and Marvel vs Capcom 3 is no exception. Even though I really enjoyed it, let me tell you about the not so stellar things that got to me heated and made me take breaks from the games at times. If you thought Bang Shishigami in BlazBlue:CS was bad, you have never had the trouble of dealing with Phoenix in Marvel 3. This character has tracking fireballs that can be performed multiple times in mid-air (Rectified in ultimate) and has a teleport. At the cost of 5 super bars (Easier to get than you might assume) she can transform into “Dark Phoenix” which restores all health and gives her a massive damage boost at the cost of draining her life (Think Ragna the Bloodedge’s “Blood Kain” but more broken). When she is in X-Factor Lvl. 3 with Dark Phoenix, she can obliterate entire teams in the blink of an eye, often in six jabs or less. Teams popped up which centered around D. Phoenix and takes absolutely no skill to play, can be beaten but often difficult once she is powered up and has X-Factor. Often times, able to OCV the entire team and can sing a definitive end to about any match as soon as the person who controls D. Phoenix gets 5 bars. The mirror matches were a complete joke and a button mashing fest to see who got hit first, as they would win. Also, it is to be mentioned that much “Anti-Phoenix Technology” was discovered, but is often hard to implement because most of it requires you killing Phoenix with an OTG (On The Ground) move, but she often died and began her transformation process “I CAN’T CONTROL IT!” where you could not easily set up a situation to kill her as she transformed. This character would be beaten and it was possible to stop it, but overall it was something that should have been left out of the game, same with X-Factor Lvl. 3 which made it possible for some characters like Wesker/Sentinel/Dante to be able to destroy an entire team without it being even half-way gone. X-Factor lasts entirely too long and does significant amount of damage. I think this shows that games do not need built in comeback mechanics and those things should be made on the part of the user. Something I really hated about this game is the tension that it sometimes caused between me and my friends, or seeing my friends very distressed by what was going on in the game at the time. Rasean often got mad at the controller, his own execution techniques, or things within the game that promoted nonsensical actions. Ryan was often saying he was not every good at the game and was waiting for Ultimate MvC 3 to really show his stuff, Brandon often said that the game was very gimmicky and that he could not find a third character (Like myself). Saraí often said she was not very good and that we were always above her, even though she came in 2nd in a Marvel vs Capcom 3 tournament in Mexico. Sometimes it threatened to tear me and my online friends apart. Me and Saraí got into various arguments over the game and Rasean and myself got into a heated discussion talking about Dark Phoenix at first, and how she can potentially break the game and was dominating major tournaments. Brandon and myself discussed Marvel vs Capcom 2 vs Marvel vs Capcom 3 and how he believed MvC 2 was better, even though MvC 3 had more viable characters. It was huge but we all got into an understanding eventually, though, me and Saraí are no longer friends. Assists are something that have been a unique part of the Marvel Vs. Series, though, invincible assists such as Gustaf Flame (Tron Bonne) as well as Double Lariat (Hagger) made some people nearly inapproachable and some seemingly indestructible. Viscant, the winner of Marvel vs Capcom 3’s Evolution 2011 tournament won using the team of Wesker/Hagger/Phoenix. The most broken character combined with the most invincible assist combined with someone who does insane amount of damage and is X-Factor Lvl. 3 OCV viable. Winning with mainly Wesker and Dark Phoenix, Hagger very rarely had to see the light as he got destroyed when he did; showing that he only needed Wesker, Phoenix, and a way to stop nearly all incoming attacks in order to win. Though, he did lose in Flocker’s OCV later down the line, it showed that, at its core, MvC 3 could come down to very basic game play and win off of nothing but overpowered tactics. Also, I cannot tell you how many times I have lost to Hulk/Sentinel on the main basis that they have super armor which make sit hard to fight against. When using a team of Hulk/Hagger/Sentinel, it was easy to pin down people and kill them in almost just a single, basic combo. The fact that people cannot attack without fear of losing out to it is insane. Though, this does make Hulk better than his MvC 2 counterpart and make sense given his size, they should have did something more akin to the MvC 2 side and let him absorb hits better without swinging right through certain moves, but it does work well in this game. Marvel vs Capcom 3: Fate of Two Worlds provided hours upon hours of entertainment for me. I have not yet grown tired as I am only trading in this vanilla copy in order to obtain the upgraded version. Even though it has a lot of major flaws, it is still enjoyable and competitive among my friends and I have much fun learning and playing. Beautiful graphics, beautiful music, and a diverse range of playing styles made this one of my favorite fighters to date and a fitting update to the Marvel series. This is a fond farewell. Be sure to post your stats as well. Thank you for reading! 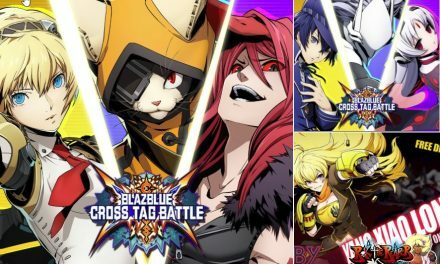 BlazBlue Cross Tag Battle — Yang, Character Packs 2 & 3 Release Date!